When it comes to choosing the security for your construction site, there are a number of different options available. Should your business opt for a manned-security guard, who has a physical presence on your site? Should you choose to install CCTV cameras to deter criminals? Or, should you choose a remote CCTV monitoring system that combines the best of both options? Remote CCTV monitoring is a surveillance method where images are sent from your security cameras to a remote monitoring station. The stations are specifically designed to respond rapidly to any suspicious activity and protect your business from criminal damage. But what are the advantages of using this system over the alternatives? By opting for a remote CCTV monitoring system on your construction site over manned security you can save a significant amount of money. By employing an on-site guard, you have to factor in the cost of their salary. To be effective, your guard would have to be present for many hours at a time, which is impossible for one employee to do on their own. This results in multiple salaries and a larger outgoing for the business. In contrast, a remote CCTV monitoring system can keep track of your premises for a much longer time for the same, or a lower cost. Remote CCTV monitoring is far more reliable than a manned security guard as it is always recording. There is no chance of the camera becoming distracted and losing focus like a manned security guard may do, and it can continue to record for long periods of time. Here at CCTV Monitoring, we go one step further in providing reliable remote monitoring, including several alternative power sources to ensure that your security system doesn’t encounter any downtime. We offer Solar-Guard powered site security, Battery Backup stand-alone solution for sites that have to shut down their generators overnight, and Battery CCTV systems for sites where mains power is unavailable and wired detection is not an option. Remote CCTV monitoring systems have an almost instant response rate. Should an intruder or break-in be detected, a remote monitoring system can alert the emergency services within minutes of detecting the movements. Without a remote monitoring service in place to react to threats, CCTV is simply a tool for providing footage as evidence after the damage has been done and a company has fallen foul to theft. Often, the simple presence of a security camera is enough to deter criminals. However, for those that require more deterrents, many remote monitoring services, like those offered here at CCTV Monitoring, including alarm systems and verbal warning deterrents communicated over the loudspeaker. Audio warnings are a key part of remote monitored CCTV security systems and are central to remote monitoring functioning successfully. A live announcement from a remote location makes the intruder aware they are being watched live, and that emergency services will be notified. The combination of these two deterrents helps to drive away would-be-criminals and does not risk the safety of any on-site staff that an intruder may try to target, potentially saving businesses thousands of pounds in damage. 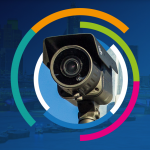 Remote CCTV monitoring systems are incredibly flexible and allow for the monitoring of multiple sites at a single time which is something a manned security guard is unable to do. Even more impressive is the ability to move cameras and systems as projects grow. 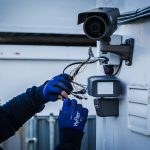 There are a number of different security systems that can be installed to provide the ideal combination of cameras to cover as much of your site as required. Security cameras can be moved and manipulated remotely, allowing you to achieve the best possible angle for the circumstances.